In addition to our top five restaurants of 2018, we decided to spice things up and rate our top five dishes of 2018, like we did last year. 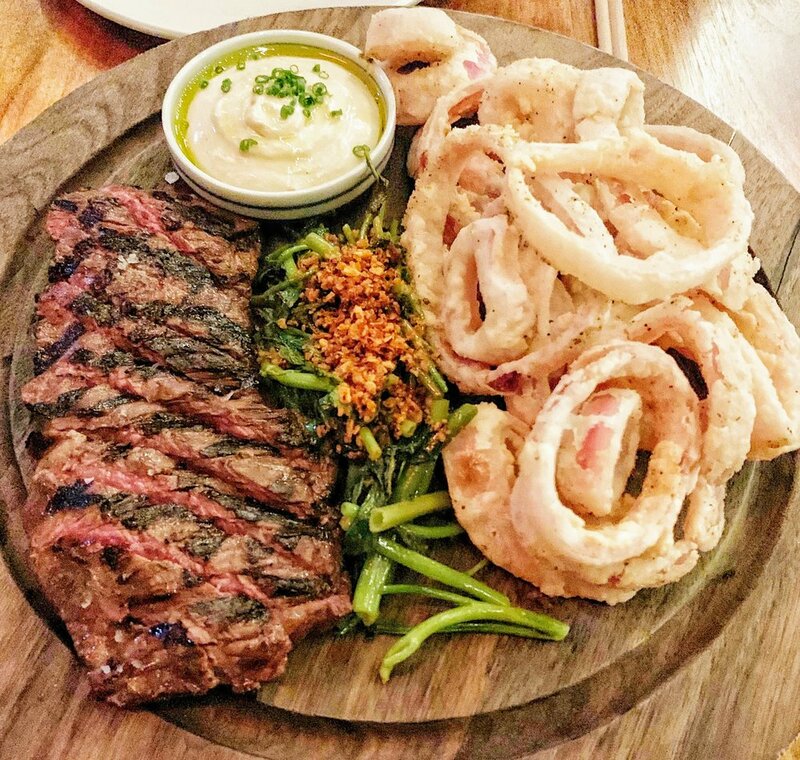 Sometimes, we really love a particular dish at a certain restaurant, or something smaller at a casual place that is worthy of the title of "best dish," when "best restaurant" doesn't quite make the cut. 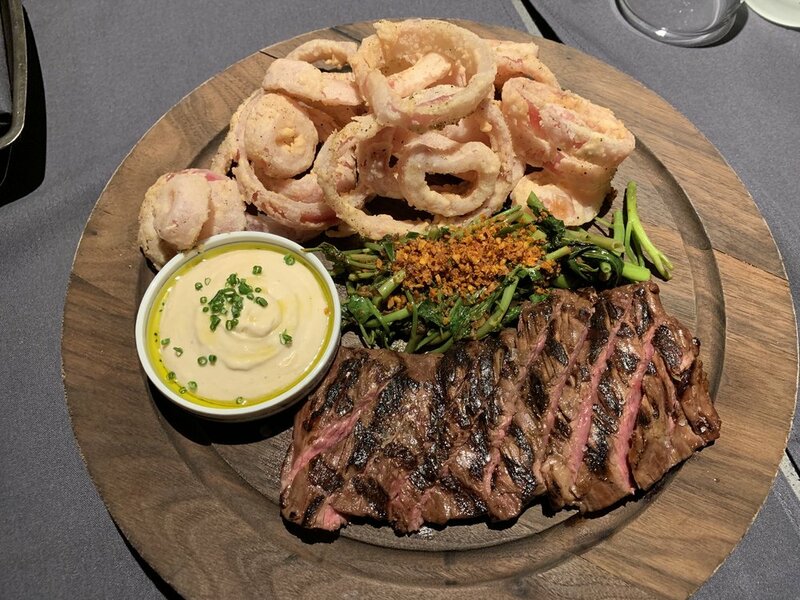 Without further ado, here are our top five dishes of 2018! Our overall experience at Osteria Francescana was a slight disappointment, but the the most famous dish by Massimo Bottura was excellent. I could have eaten 100 of these. You knew we weren’t going to get through this list without a dish from Noma. I had to think long and hard about which dish to choose, and I ultimately chose the celeriac shawarma because of how unique it was. This was 100% vegetarian and it tasted like the best, most savory meat shawarma you’ve ever had. Of course the truffle sauce didn’t hurt, and also the sourdough bread to mop up the sauce was next level, too. We saw the Chef’s Table on Corrado Assenza and immediately booked a flight to Sicily. We came for the almond granita, and we were not disappointed. Words can’t describe how clean and natural the almond flavor is, so just stare at the picture and then book your Ryanair flight stat. You haven’t had rye bread until you’ve had the rye bread at Langers in LA. Put a pastrami reuben in between two slices of the heavenly bread and you’ve got yourself one of the best sandwiches in the world. This was one of the most unique dishes we had in Copenhagen. Think of a very spicy ceviche with mostly Danish ingredients and a strawberry acid broth. A revelation that could have easily made the top five if we hadn’t spent so much time in Copenhagen this year. These onion rings were the best I’ve ever had. Oh Noma. You are my whole life. Jason didn’t have as strong a feeling about this dish as I did, but my goodness, it blew me away. A tortilla with, yes, mold growing on it, much like the rind of brie cheese. The inside was filled with a shock of cold, creamy ice cream and a balsamic fig sauce. I can’t even conceive how someone could conceive of it, you dig? 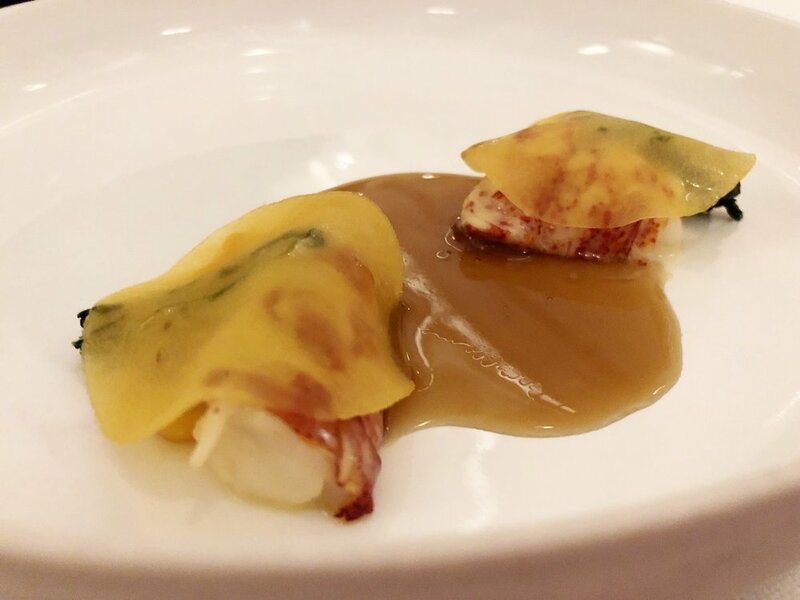 While much of our experience at Osteria Francescana left something to be desired, Massimo Bottura’s most famous dish did not disappoint in the slightest, and both of us felt that it made the trip to Modena worthwhile in a single bite. Parmesan is such a rich, umami flavor, and getting all of the different ages and textures together was nothing short of mind-blowing. Also, the portion was more generous that what you would expect for a tasting menu, which pleased us thoroughly, as we both could have eaten a vat. 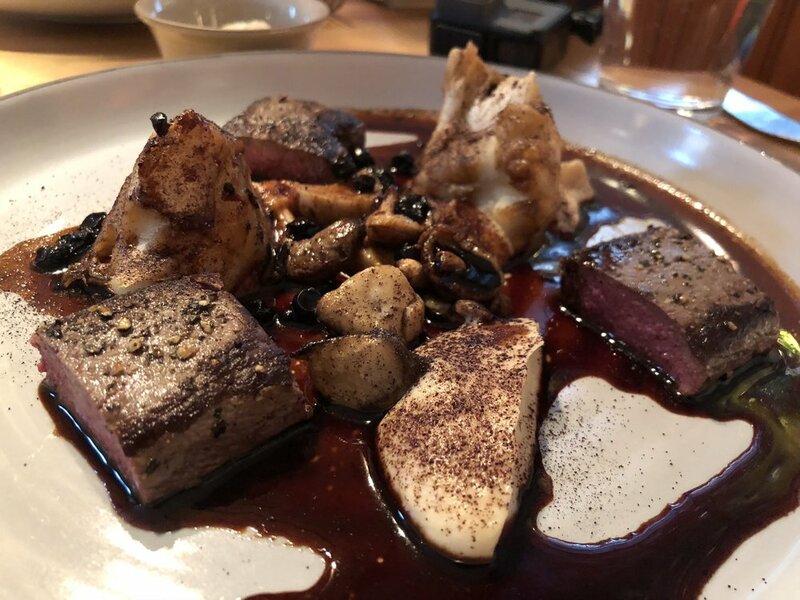 On our second visit to Amass (we also went in November 2017), we dined a la carte at the bar. During this meal, we had a roast chicken from Hegnsholt farm with a sauce made from reduced carrot and almond milk, and it blew me away. I typically don’t even like chicken, and I never order it. This changed my worldview. I could drink this sauce on the daily. Oh, Corrado Assenza, you are a god among men. Eating the classic Sicilian breakfast of warm brioche and creamy almond milk granita was a life experience I won’t soon forget. Whereas most Italian granitas are made with a syrup (which is still delicious, mind you), Assensa’s family version is made with a freshly-made almond milk, which retains the grittiness and full-bodied flavor of the Sicilian almonds used to make it. Neither the brioche or the granita are overly sweet, and though this seems like an intense breakfast option, I promise it simply hits the spot. 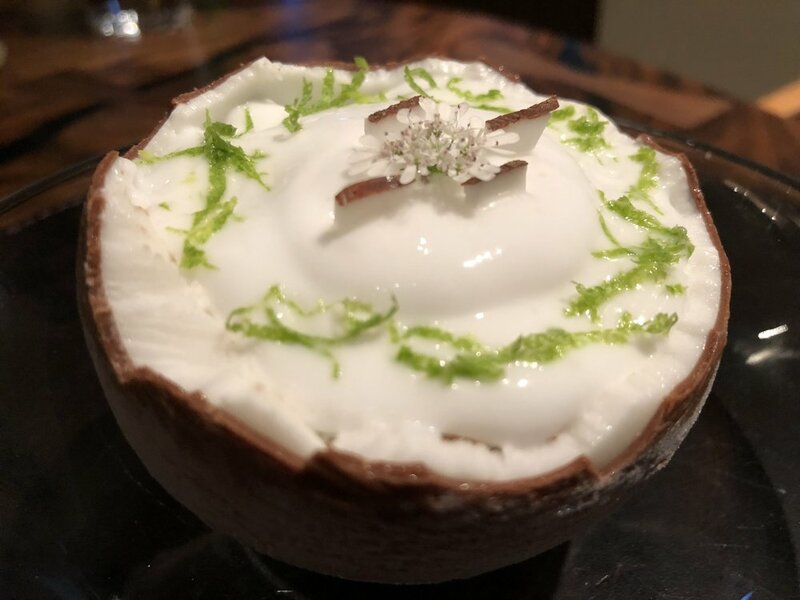 The coconut dessert from Atelier Crenn is as if I imagined the ideal dessert in my mind and Dominique Crenn brought it to life. Imagine a creamy coconut pudding studded with pineapples inside of a bowl made entirely of chocolate. Yeah. That sort of begins to cover it. Also, the portion was exceedingly generous for a dish that comes near the end of a 17 course tasting menu, which I appreciated. Just because I’ve eaten a lot doesn’t mean I want to skimp on dessert, you feel me? We want to go to Spain to try this dish in the flesh. The Jasper Hill Farm Cheesecake with hazelnut, white chocolate, and cookies, inspired by Albert Adria’s dish from Tickets in Barcelona. It’s cheese. It’s chocolate. It’s a party. 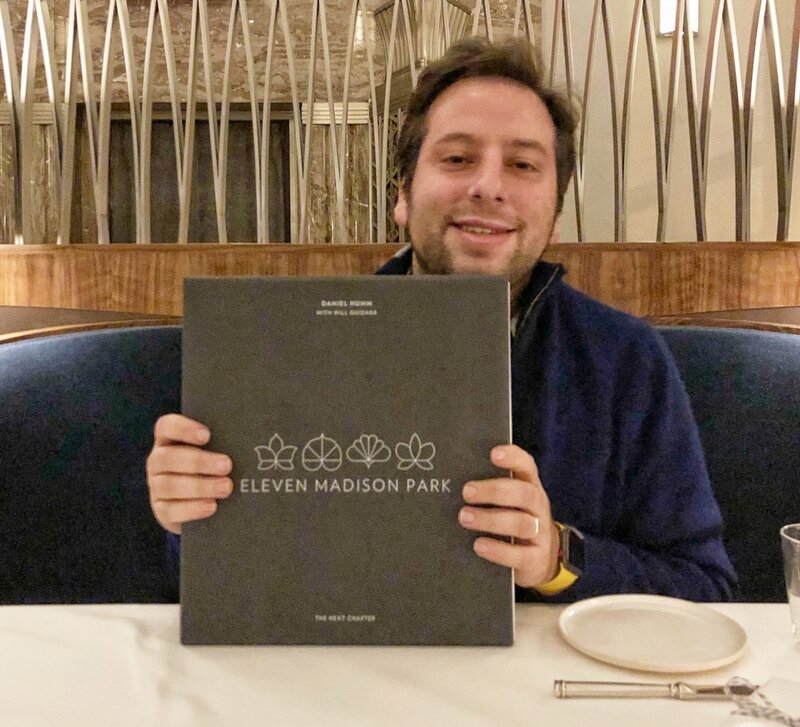 Eleven Madison Park (EMP) was opened in 1998 by world renowned restaurateur Danny Meyer. Meyer is the man behind NYC institutions Union Square Cafe, Gramercy Tavern, Blue Smoke, and...SHAKE SHACK. Yes, the same genius behind Shake Shack founded what some considered the best restaurant in the world. In 2006, Meyer hired Daniel Humm as head chef, and he and Danny (that's what his friends call him) quickly turned EMP into one of the top restaurants in New York. Humm bought the restaurant from Meyer in 2011, which is when EMP earned its first Michelin Star. By 2012, they had earned three Michelin Stars. Currently the restaurant ranks #1 in the world. When booking a reservation, you have two options. You can do the full tasting menu in the main dining room for $315/person, or you can do an abbreviated five course tasting menu in the bar room for $175/person. We went for the full tasting menu, because that's how we live our lives. When you arrive at the table you are presented with a box. What's in the box? This black and white cookie--a savory nod to the famous NYC staple. It's a great first bite to start the meal. The first real course was the bread course, which we learned was designed for the winter menu to provide something hot to warm us as we began our meal. This course consisted of four distinct parts: bread, scallop butter, scallop broth, and then live scallops with sea urchin immediately following this. Yvonne was obsessed with this butter (check out her other website: www.yvonnelovesbutter.net), which was creamy with a rich, umami scallop flavor. My favorite part of this dish was the scallop broth, which was thick and flavorful, and tasted somewhat like the best miso soup you've ever had in your life. The raw scallop with sea urchin was presently nicely on a seashell. It felt as if we were in The Little Mermaid, receiving a pearl from our boyfriend Eric (love you, Eric!). Another play on an NYC favorite: eggs benedict. 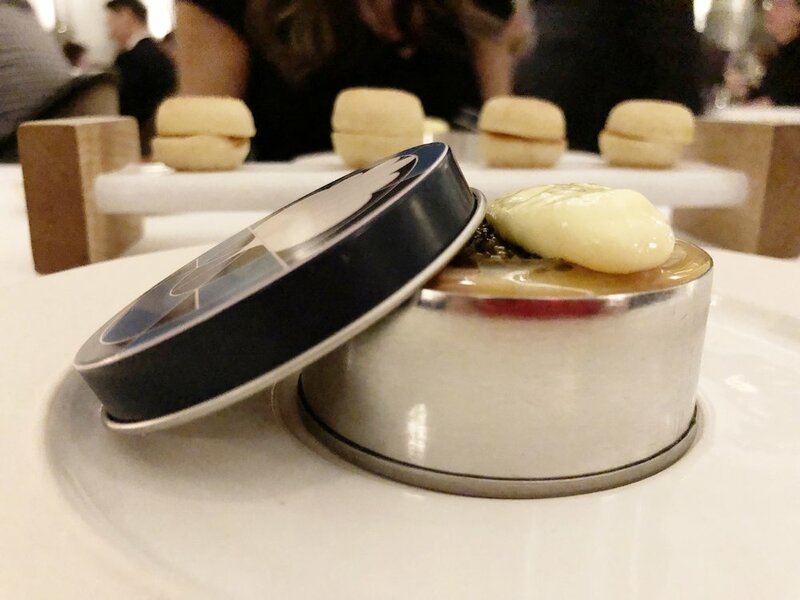 This was probably the coolest presentation of the night, with the caviar in a special EMP tin, which we later got to take home, as well as a row of small English muffins presented on an elevated wood plank. We loved the interactive element of making our little sandwiches with the quail egg and caviar provided. At this point in the meal, we were given choices as to what we wanted. I chose the squid, and Yvonne chose the foie gras. The squid tasted like a tartare, refreshing and cold with the slight kick of the horseradish. 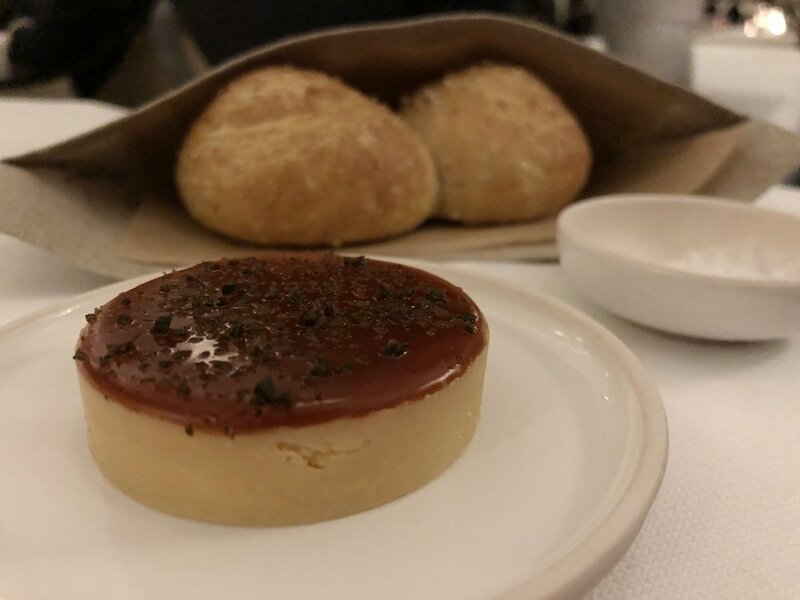 Yvonne proclaimed this to be the best foie gras she has ever had. 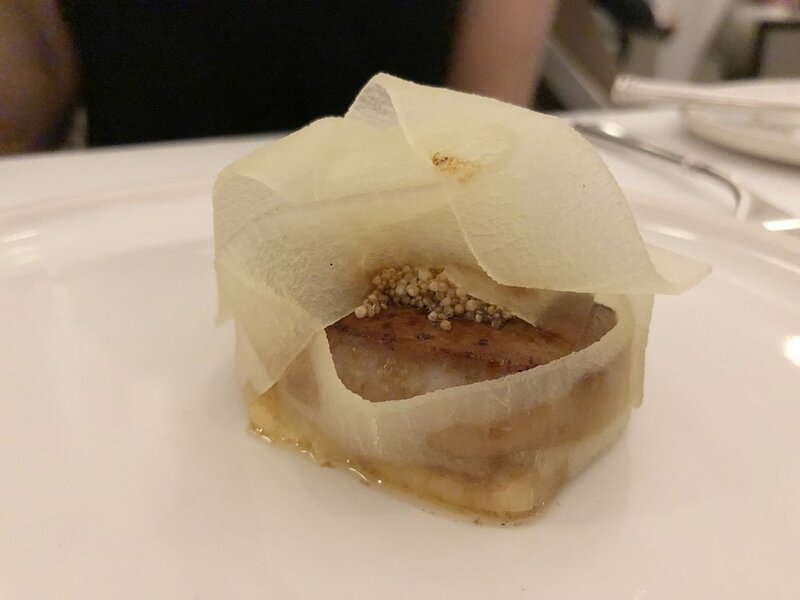 The presentation with the thinly sliced apple hiding the foie gras was on point. This was the surprise of the night for me. When I ordered the halibut, I wasn't excited, but I wanted to order something different from Yvonne. The halibut was excellent, and the turnip was presented in three ways--in the sauce, mixed with the halibut, and then sauteed underneath the halibut. Really a refreshing and surprising way to serve both the halibut and turnips, and a truly special EMP dish. This was the stereotypical lobster dish at a nice restaurant. Cooked right. Tasted good, but nothing really memorable. This was the one table side preparation of the meal. The captain wheeled over a cart and proceeded to cut open a crust that was baking on top of a cast iron pan. 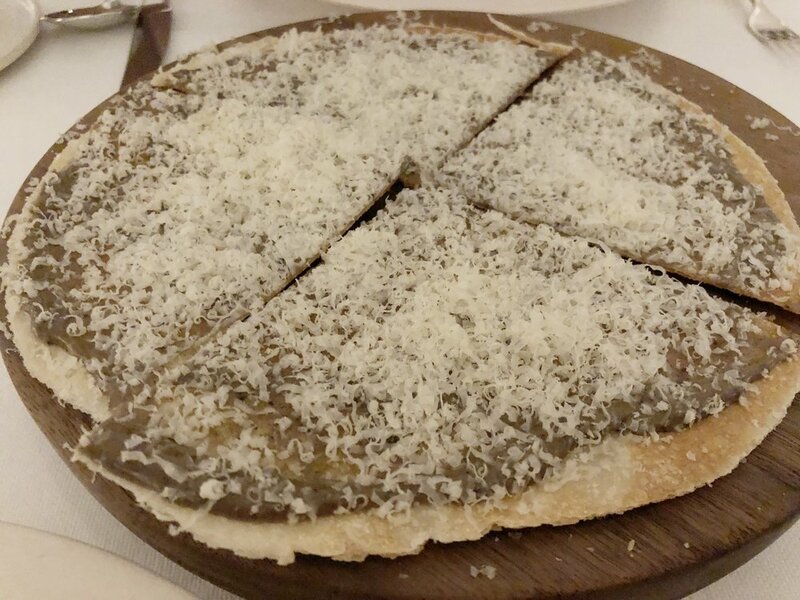 She then took the crust and turned it into the "pizza" crust, which she then lathered with black truffle & cremini paste and shaved cheddar cheese. So good. so cool. It was also served with a melange of portabello and cremini mushrooms on the side. This duck is everything to me. It's the best duck in the world. What makes it so special? It's the skin, which is thick and crusted with Szechuan peppercorns and glazed with honey and lavender. The actual duck meat is cooked medium rare and has the perfect tenderness to match the slight crunch of the crust. It's the most perfect bird I've ever had. EMP's take on a cheese course. They bring out a perfectly grilled circle of cheese with black truffle, and then also mix a salad right in front of you with black truffle vinaigrette. This grilled cheese was as down home as Eleven Madison Park can get, but with the black truffle thrown in to make sure you remember where you are. A great dish to end the savory courses. Our favorite dessert. 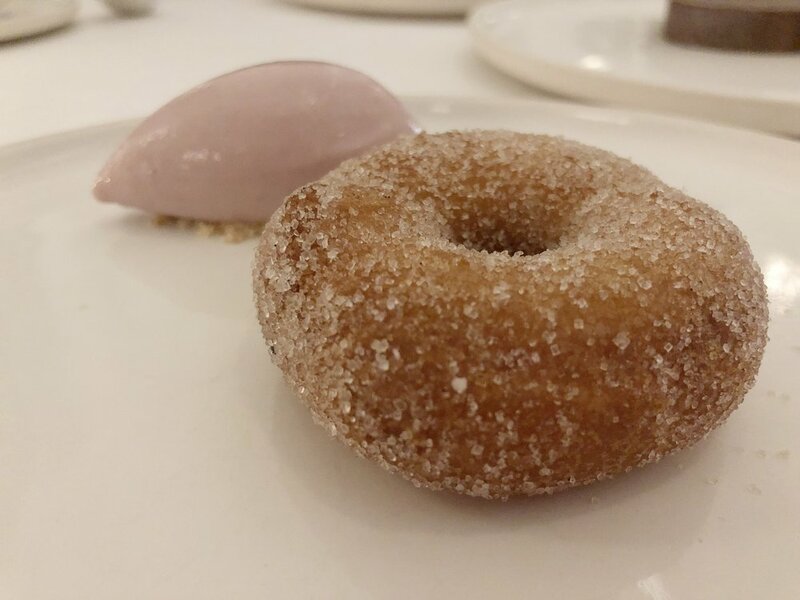 The donut was filled with cranberry and pear, but the star of the show for me was the mulled wine ice cream. What a unique and cool flavor! I could have eaten a whole pint of it. A very warm winter dessert. I love a good pumpkin anything, #PSL for life. I am also a sucker for exotic ice creams (see mulled wine above). So this one was good. And that's how I would describe the desserts at EMP: just good. Overall, the desserts are kind of disappointing for the type of restaurant and the standard of EMP. Again, a solid desert but nothing to write home about. Tasted good at the time, but we're not going to remember it a month from now. The last bite, and one of the best. This is the best chocolate covered pretzel I've ever had, hands down. What made this so good was the chocolate to pretzel ratio was perfect. The pretzels were made in house, and had a doughy, marzipan taste. Okay, so we screwed up and didn't order an alcoholic beverage, which was stupid because they are known for having amazing cocktails. In our defense, we did have two two pickle backs immediately before dinner at my old favorite haunt, Whiskey Rebel, with best friend of the blog Vishnu "Charlotte Heartthrob" Pillai. The cocktail menu was presented by ingredient. The options included apple, chocolate, sarsaparilla, cranberry, kombu, and others. They also offered non-alcoholic options. I went for the mushroom mocktail, because I'd never had a drink made with mushrooms before. I guess I grew up sheltered and unaware of what the world had to offer. This was one of the coolest drinks I've ever had. I can only explain the flavor as mushroom with a sweet coffee aftertaste. The mushroom wasn't overwhelming, though. It was a flavor I have never had before, and I loved it. Eleven Madison Park has the coolest and best atmosphere of any top notch restaurant we've been to. It feels like you're walking into The Great Gatsby, because you sort of are. The restaurant is located in an art deco lobby of an office building originally owned by Met Life. The chandeliers and crown molding are all original, and the large florescent light on the ceiling was the first florescent light in New York City. The restaurant was just renovated a few months ago, with subtle changes. Sometimes when you go to the world's best restaurants, the atmosphere is museum like, with patrons almost scared to have too much fun. EMP was different. Everyone seemed like they were having a really good time. The waiters also seemed to have a sense of humor, and they weren't afraid to joke with patrons or chat with them, cutting the tension that often comes with a restaurant of this stature. Eleven Madison Park has the best service of any restaurant we have been to. Hands down. From the moment you walk in, you feel like you're the only patron that matters in the restaurant. But it's not stuffy--the servers joke around, and, of course, they answer literally any question you have about the restaurant in a split second. Special requests? Glad you asked. There is literally a person whose job it is to make people's experiences magical. If a waiter overhears that someone loves ice cream, for instance, you might get a house-made pint of ice cream to take home at the end of the meal. Want all of the desserts instead of choosing just one? Just ask. We did. Want a pet baby lion delivered to your table at the end of the meal? Okay, maybe not, but you get the point. EMP spends a lot of effort on their hospitality, and it pays off. We made a special request to be instantly transported to the 1920s, and we are now stuck in a time warp; Shout out to Rita Ackermann (no relation), who painted the large abstract on the wall; Every meal should start with cookies; Not getting a cocktail at EMP is like refusing wine from Jesus; We are regretting not dropping hints about our love of ice cream. 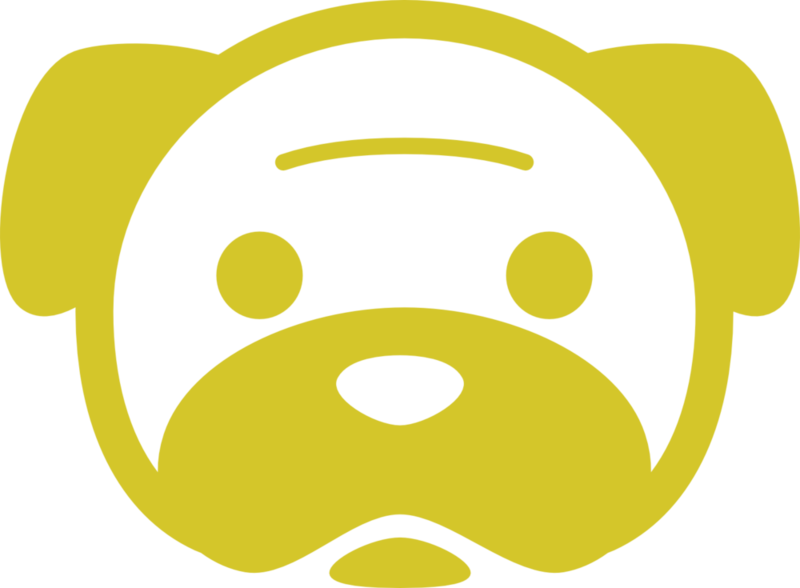 Listen to this post in audio format on our podcast! In addition to our top five restaurants of 2017, we decided to spice things up and rate our top five dishes of 2017. Sometimes, we really love a particular dish at a certain restaurant, or something smaller at a casual place that is worthy of the title of "best dish," when "best restaurant" doesn't quite make the cut. Without further ado, here are our top five dishes of 2017! This, to me, is the most perfect dish in the world. It's the best thing I've ever eaten, hands down. Enough said. The Z-man was a revelation--one BBQ sandwich to rule them all. This was the outstanding dish of Peru to me. The suckling pig mixed with dark Peruvian chocolate in a peanut broth just combined perfectly together. I would have never thought that the rich chocolate would have gone together with the suckling pig, but it did, and it was great. The single dessert I think about the most from this last year is the sportskage from La Glace in Copenhagen. This is the oldest and most famous bakery in Copenhagen, and their signature cake dates back to 1891 when it was first made for the debut of the play, Sports Man. It consists of crushed nougat, whipped cream, a macaroon bottom, and caramelized choux pastry. It had the consistency of a cream pie, but with almost a health bar taste with the nougat. So good! The Mac & Cheese at Haberdish is cheesy perfection. The key to this dish is the hot sauce that adds a slight kick to the chicken skin. I could eat it every day! Although Maido didn't make either of our best restaurant lists, we both really loved so many of the dishes there. This dessert had local Peruvian elements, like granadilla, mandarin sorbet, and lucuma ice cream. Also, you can't go wrong with an edible bowl made out of sugar! I would gladly wait another hour in line to eat this perfect sandwich again. The meat was juicy and well-seasoned, and the vegetables were fresher than you could ever imagine from a food cart. This kebab was certainly a part of what made our culinary adventures in Berlin special! Jason wants to kill me for this choice, but after a seven hour hike through the Andes to Machu Picchu, this tomato soup brought me back to life. I loved the little town of Aguas Calientes, which is completely devoted to tourists visiting Machu Picchu--it felt like a mining town in the American west, only Peruvian style. Also, maybe, just maybe, I picked it partly because it gets under his skin. Shhhh, don't tell. I am usually more of a pulled pork kind gal, but these ribs were everything to me. The flavor was 10/10, and I loved the atmosphere in the gas station at the original Joe's location. I love when Jason takes me to NYC and shows me all of his old college haunts, like the tiny, counter-seating only Mamoun's location he took me to last March. I wish we had a quick & cheap Lebanese spot like this in Charlotte. Their hummus was tangy, fresh, and had the perfect texture. Listen to this post in audio format on our awesome blossom podcast! What a year! Scallionpancake traveled three continents in 2017, and during our travels we visited some of the best restaurants in the world. Like years past, both of us have come up with our top five restaurants for 2017. SPOILER ALERT: Next week we will publish our top five dishes of 2017. Stay tuned! The most magical food night of the year for me. The atmosphere combined with the excellent food made for an unforgettable experience. My favorite dish was the "make your own" shrimp tacos. Noma also had a delicious almond cake with lime zest that was out of this world. I've said it before, and i'll say it again, I love David Chang. Ko is his signature restaurant, and it did not disappoint. I had been to Ko at their old location about five years ago, so I was excited to to see what had changed at their new location. Ko is meat-focused fine dining, and I like that. They're most famous for their duck, which they age in-house every week. 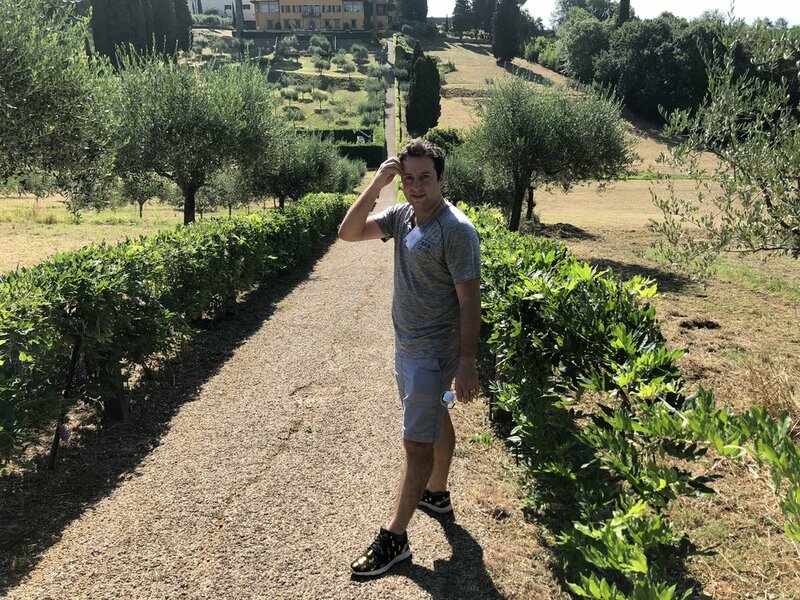 This fall, I took a trip to Italy with my friends Vishnu and Ravi for a ten year reunion of our time studying abroad in Florence. We took a special trip to Modena to go to Franchesetta 58, Massimo Baturo's sister restaurant to his famous Osteria Francescana. It was outstanding and served some of the best Italian inspired dishes I've ever had. My favorite dish was the pumpkin covered in Parmesan sauce with bacon. The sweetness of the pumpkin with the salty, strong flavors of the Parmesan combined with the fattiness of the bacon to make the perfect dish. 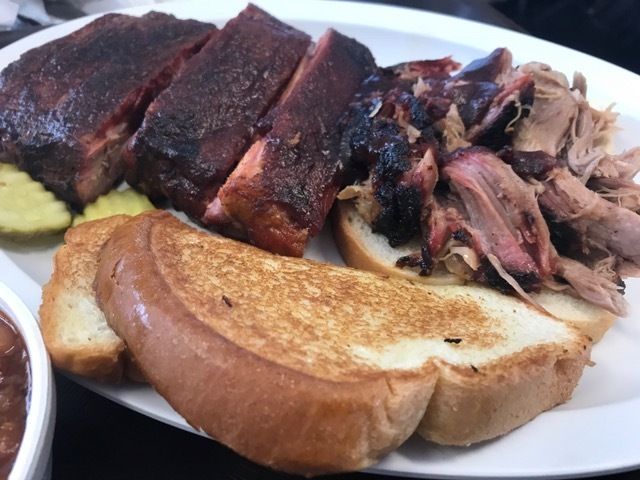 Joe's BBQ in Kansas City has a lot of hype, but it lives up to it and then some. The best sandwich of the year goes to the Z-Man: smoked brisket, smoked provolone, two onion rings, and famous Joe's BBQ sauce on a bun. It doesn't get better than this. We enjoyed our meal so much that we went back the next day and ordered two--one for right then and there and one for the plane ride home. We went to LA in January, and the standout restaurant of the trip was Here's Looking at You. The vibe from the beginning was just plain cool--we felt like we were in a place where cool things happened and where cool people hung out. Oh, by the way, the food was really good, too. The standouts for me were this fried whole fish and the bar pie. I couldn't agree more with Jason--the vibe at Noma Under the Bridge was just magical. It was our first night in my favorite city on earth. The temperature was crisp and the sun was setting along the harbor when we settled into the long dining room table with about 75 new friends from all over the world. The night started with champagne and ended with almond cakes in an antique tin, and that's really all anyone could ask for out of a vacation dinner. Jason and I are still sorting out our feelings on Central (more on that on our podcast), but I do know that I absolutely loved the flavors of so many of the dishes we tried, particularly the dessert made with meringue clay and algae, and the potatoes with an alpaca dipping sauce. Central is the restaurant I would most like to experience again, if only to have more time to figure out exactly which obscure plant we were eating. The creativity on the Elevations menu is incomparable, and going on a culinary journey through the ecosystem home to the most diverse climate on earth was a once in a lifetime experience. Ko was just a downright fun dining experience; I have never had the pleasure of viewing the kitchen directly from my seat in a fine dining restaurant, and I loved every minute of it. We got to chat with the chefs and it was pure entertainment to watch them work throughout our meal. We saw them prepare the duck from the moment we sat down--it went through step after step of marinating and braising, and then finally we got to try it. Super exciting. Another highlight? The bouncy Japanese cheesecake with shaved truffles. I die. Everything at Geranium was a cut above, from the decor, to the service, to the food. I mean, wheeling out a cart of potted herbs to prepare a hot tea? It was all just next level. 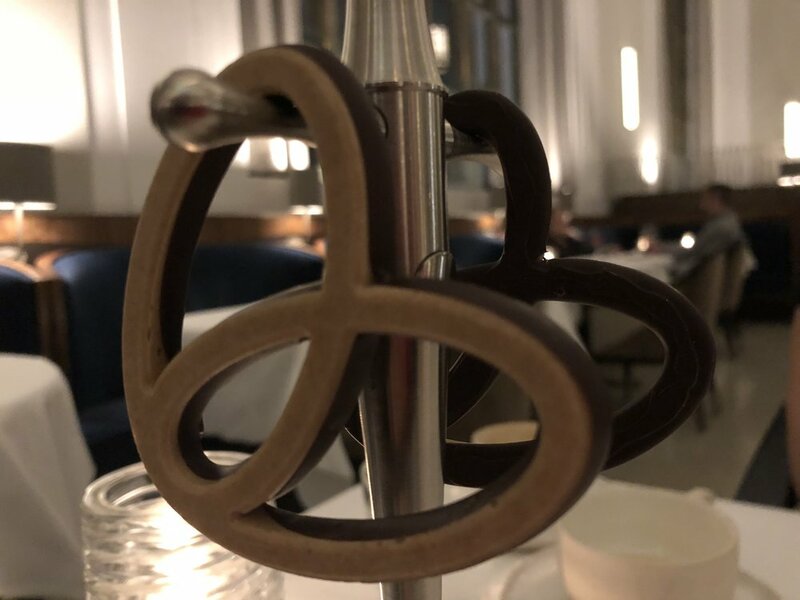 The dishes were inventive, like the dill stones and the razor clam dish, and everything had incredible flavor that captured the vegetation-heavy feel of modern classic Danish cuisine. One of my favorite moments here was the final dessert course that included so many little bites of goodness. Also, getting to meet the chef when he was in the back room preparing new recipes was pretty darn cool, too. As you heard on the podcast, Jason is rather rude about my choice of Baest, but gosh darn it, I'm sticking to it. Pizza is a simple meal that ranges from good to omgsogood, and that's what I enjoy about it. With five or six top notch ingredients, a well-made pizza can compete with more complex dishes any day of the week. Also, the cured meats and in-house made mozzarella with a drizzle of olive oil and a sprinkle of sea salt basically took me to another planet. Oh, and the dessert! Milk gelato with olive oil? I was in hygge heaven while dining at Baest. Scallionpancake has been extremely fortunate to go to five of the top restaurants in the world this year. Geranium makes the list at number #19 under the creative talents of Head Chef Rasmus Kofoed. Kofoed opened up Geranium in 2007 after working at a fancy hotel in Copenhagen, and it quickly climbed the ranks of all of the "best" lists; it's the only restaurant in Copenhagen to have three Michelin stars (yes—it's hard to believe, but Noma only had two before it closed for renovations!). Fun fact about Kofoed, according to the Top 50 list, "Kofoed is the only chef to have ever won bronze, silver and gold at the prestigious Bocuse d’Or cooking competition in France." Impressive! You only have one choice here, and that's the Universe tasting menu. This is a three hour experience, so buckle up ladies and gentlemen, and get ready for the ride. And we're off! The signature first dish is lobster. This was almost like a gelatin, with the buttery lobster contrasting with the cool, earthy carrot. We also loved the presentation with multiple dishes on top of each other. Dip the artichoke leaves in the hazelnut oil and rye vinegar mayonnaise. The signature dish of Geranium. The rumor is this took Rasmus over six years to perfect. In his book, One Day at Geranium Restaurant (which we absolutely purchased), Rasmus calls this the, "perfect abstract illusion of a razor clam shell." The shell is edible and painted with algae and charcoal to make it look like an actual razor clam shell. In the middle is a creamy razor clam tartar made with sour cream. We love eating flowers with our tomato soup. We also love ham, and we especially love fat. Mix them all together and you've got a Scallionpancake trifecta. The sourness of the tomatoes and the warm, saltiness of the ham mixed great with the aromatic herbs. This was one of our favorites. The mackerel dill stones were plated on real sea stones, to blend in as if taken directly from the sea. Of course we love dips, and why not dip your mackerel dill stones in a frozen juice of cucumber & dill with a spicy horseradish cream? Our favorite dish of the day. Cold flattened and salted hake covered in a warm buttermilk filled with Finnish caviar. Is there anything better in the world than warm caviar on a great fish? I don't think so. We always love the bread course. This bread was okay, but nothing we really need to talk about. Scallops are hard to get rght. It's easy to overcook them, and then they taste like a chewy bar of soap. Also, a scallop should be on the larger size --if they are too small, you can't get the proper texture throughout the meat. Geranium's scallops were amazing. They were presented first in a bed of sea grass, as if they magically appeared from the sea for our pleasure. The scallops were then plated in a bowl in front of us, and then the waitress poured the Filippa reduction on top. The scallops had a great rich taste, and you could cut them with a butter knife. Let's take a journey to a Danish village, where we walk along the sea and pick flowers. We stumble upon a local fisherman who, as we walk past, catches a sole on his wooden fishing pole. He cleans the fish in front of us and serves it to us lightly cooked over an open fire mixed with the flowers we had picked up along the way. You get it? Are you sensing a pattern here? Almost every dish had some sort of flower on it. The Danes love flowers on their food --it provides a pop of color and flavor to the dishes. Plus everyone knows the saying, "When you eat shrimp, you should stop and smell the roses." A big theme in all the restaurants we ate at in Copenhagen was the lack of meat. This was the only non-seafood meat on the menu, and it was not the focal point of the dish. The Danes love thier greens and seafood! What we liked about this were the sprouts, which added a nice little crunch to the chicken. Like a kiss at the end of the rainbow, more precious than a heart of gold. You know what I mean. The winner of winners when it comes to dessert. This ice cream tasted as if a million bees flew to you, spelled out your name in the air, and then presented you with their finest beeswax in the form of ice cream. It was so creamy and had the subtle flavors of beeswax and honey. Yvonne calls this the fireworks grand finale, where they bring out an onslaught of desserts all at once and then you get to go to town like it's your birthday (and we're going to party like it's your birthday). We were instructed to eat them in any order, except the green egg had to be eaten last, because it had a strong flavor. Our favorites were the marshmallows with rose hips and the cake with pumpkin seed oil. Geranium makes all of their drinks right in front of you. They are known for their gin and tonic, but we didn't try that (we were still in our non-drinking during lunch phase--lame). We ordered tea during the savory dishes, and coffee with dessert. For the tea, they roll out a cart with roots and herbs growing from pots. The waitress then asks what types of herbs you like, and then proceeds to pick them from the pots and make your tea. The coffee is presented in a similar way, with the waitress boiling the water and pressing the coffee right in front of you. The atmosphere at Geranium can best be described as friendly, yet sterile. Everything about the restaurant was clean and perfect, almost too perfect You didn't feel like you could make sarcastic jokes with the wait staff--but you know we tried to anyway. The restaurant is located on the top floor of the national soccer stadium, which provides great views of all of Copenhagen. You can even see Sweden from across the water on a clear day. The whole staff was very international, our waitresses were from Australia and Martinique, and the chef who took us of a tour of the restaurant, was from Sweden. It felt very cosmopolitan, and you could tell that there was a lot of room for collaboration and creativity in the kitchen. The kitchen overlooks the stadium-- pretty cool on match day! The service here was just as exceptional as you would expect at a fancy-shmancy place like this. What was unique, was that after the savory dishes, one of the chefs gave every guest a tour of the entire restaurant, from the test kitchen to the fermenting room. We even got to see Head Chef Kofoed, who touched me on the shoulder. I havent washed my shoulder since. Frankie also has not washed since we were in Copenhagen; It's nice to have the option to play a soccer game and then go have a three Michelin star meal, all in one block; If Frankie could have tea with anyone in history, he would pick Lassie, and then punch him in the face after; We like to be able to banter with our waiters and make them feel uncomfortable; We have started putting flowers on all of our canned tuna now that we are back in the U.S.